New Wings Part One: Domestic Troubles. Dinah Lance figures that her life ought to be more settled by now, but keeping her business afloat is a day-to-day struggle. Making her relationship with Ollie Queen work is even tougher. 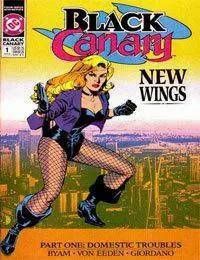 Even as the costumed crimefighter Black Canary, her confidence is shaken. Its time Dinah got out on her own and spread her New Wings! She finds the opportunity to do that when she meets a Seattle anti-drug activist and gets the chance to prove herself as the two of them become involved in a complex and dangerous drug war in their Seattle community. Green Arrow guest-stars.